Learn how and why you need to build good will, help people and expand your enterprise. The Whuffie Factor. Tara Hunt. Crown Business. 312 pages. 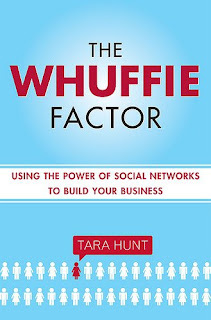 Starting out as a blogger, Hunt slowly built some capital of her own as she connected and interacted with a bunch of online contacts. She assisted people with their businesses, causes and other concerns, and accumulated lots of virtual brownie points along the way. When she was hired to develop and grow a start-up firm’s Web initiative, the enterprise boomed and her reputation was established in the business sector. She subsequently partnered with a colleague, established a consultancy and was encouraged to write this book on her experiences and insights. Facebook, Twitter, blogging and the rest are all ways to connect and interact, but if you spend any time with these media, you’ve undoubtedly encountered virtual or actual “friends” who repeatedly post what they’re doing with links for you to click that will take you where they want you to go to sample whatever delightful thing they’ve encountered or created. The problem, of course, is that there are always a few jokers who do this to excess and provide little that’s of value, except, of course, to them. Hunt cracks the whip here and pointedly shows how this type of behavior adversely affects the value of an online persona and the attendant accumulation of whuffie. In fact, Hunt makes it pretty obvious as she offers an actual table of whuffie “deposits” and “withdrawals” (p. 158) to demonstrate how one can parlay their contributions into a major score — an introduction to Wikipedia founder Jimmy Wales, for example. In addition to the mechanics of the subject, Hunts takes it to a higher plane by discussing the notion of having a bigger purpose, rather than merely pursuing a mercenary course. And that’s the difference here; the time-honored sales tactic of “asking for the order” becomes outdated in this setting. Helping people achieve their goals while pursuing your own is the way to go. That doesn’t mean that one cannot profit from this creation of good will. Far from it! One-way exchanges of value — products or services for cash — still exists; you don’t necessarily need to build a close personal relationship with Steve Jobs, for example, to enjoy your IPod Touch. But there are implicit promises made by companies that can serve as catalysts for commerce, and establishing connections with buyers and other stakeholders has emerged as an important element of commerce. As “The Cluetrain Manifesto” authors stated nearly a decade ago, “marketing is a conversation.” Tara Hunt’s book can help businesses and individuals gently break the ice.